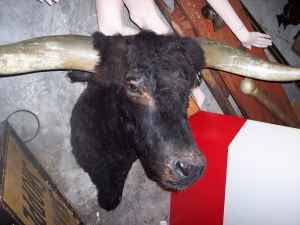 theAd>>I have 2 longhorn mounts - one brown and white and one black. I have been asking $1500 each but need to sell these. Where on earth are you photographing these? In your weird crap-a-torium?! You know those dreams where you are falling and random items are flying past you...is that your garage? Really....so creepy and 1500? Which is it, are you asking 1500 or do you need to sell them. Cause I don't see both happening.